A tragic example of this is the case People v. Collins, in which a prosecutor asked a mathematician (as an expert witness) a question of the form, "assuming these events are independent, what is the probability that...". The events were obviously not independent, things like "drives a convertible", "has a caucasian girlfriend", "girlfriend has blond hair", and some others. The mathematician answered the misleading question correctly (assuming independence), and the defendant went to jail. The California Supreme Court later overturned the verdict, in a decision that shows a surprisingly solid understanding of probability. This case could be required reading (the supreme court decision, anyway) in any introduction to probability course. It has counting, independence, and conditional probability all involved in a fundamental way. Here are some examples, ranging from the comical to the debatable. Interesting/Rigorous but still quite a stretch: The work of Alain Badiou on set theory, although more rigorous and advanced, also provides a very good resource for misapplications of formal mathematics in order to draw non-mathematical conclusions, cf. especially Being and Event which is his magnum opus, in which he uses set theory to support the tagline that 'Mathematics is Ontology'. Unlike Lacan, Badiou at least knows his stuff when it comes to the statement and development of formal results. That said, his interpretations and conclusions are often huge stretches. Pretty much anything philosophical that has been written about the so-called Skolem Paradox involves formal-to-informal entailments. My favourite in this direction is an application of Noether's theorem to public relations: Sha, "Noether's Theorem: The Science of Symmetry and the Law of Conservation", J. Public Relations Research, 16 (2004) 391-416. Noether's Theorem shows that symmetry-or change-can only exist simultaneously with conservation or invariance. For public relations, the implication is that an organization can behave "symmetrically" while maintaining certain beliefs, principles, or purposes that will never be relinquished. A case study of the Democratic Progressive Party (DPP) on Taiwan using participant observation (13 months), qualitative interviews (n = 22), and a quantitative survey (n = 166; response rate = 28.77%) showed that the organization exhibited symmetry by reaching out to external publics, engaging in dialogue with them, and expressing openness regarding Taiwan independence. Simultaneously, the party conserved its interests in gaining power and establishing an independent Taiwan. Recent electoral victories of the DPP suggest the effectiveness of symmetry-conservation for public relations practice. This is not an answer. Just a very long comment. Mostly I am stunned by the answers given. (1) I'm surprised to see Lacan featured as the main example. What I see in these quotes is an attempt to formalise human condition. Is it laughable? Yes! But no more that 16th century physics and widely taken as such. I'm pretty sure 99,9% of the human population never heard of Lacan and was never affected by his thoughts on maths in any way. (2) If I was in the audience for a talk on "Theorems misapplied to non-mathematical contexts" I'd selfishly want to see examples that affected me or someone I know. Amazingly, none of the answers given until now mentionned the field of ECONOMICS. Some people in this field are passing opinions (often political) for mathematical facts every day and this translates into policies that have influence on the lives of millions (if not billions) of people. Just an example. When the subprime mortgage buble exploded, we heard most banks and insurance companies were shocked because "their experts(*) said the price of houses couldn't go down everywhere in the US at the same time". In fancier terms, it was widely believed that the use of Collateralized Debt Obligations (CDO) and Credit Default Swaps (CDS) were minimizing the risk of default while it was actually just spreading and increasing it. I am very ignorant in mathematical finance but I'd like someone to try and explain to me which theorems that was based on. I'm pretty sure this should go straight to the top of the list. (*) I used the word "experts" as a generic word for "economists and mathematicians employed by financial institutions". Conservation of angular momentum does not mean what people think it means. If you have an object spinning on a flat surface, it can't turn around without outside forces, right? Wrong, the rattleback toy does this (video). The Coriolis effect is real, but the idea that this has something to do with the direction water spins down the drain is a false urban legend. There are very many examples of the misuse of probability arguments in legal cases. See e.g. the Prosecutor's fallacy. There has also been an interest in using quantum uncertainty, and the breakdown of rigid determinism that it ensures, to defend the concept of free will and to provide a channel for divine action in the world in the face of unbreakable laws of nature. "Therefore, socialist economy is impossible, in every sense of the word." The debate is over whether a Central Planning Board can, even in theory, correctly price goods and services, as it is assumed a market economy can. Socialists such as Dickinson argued that a market economy can, in principle, be simulated by the Board, even if it means solving a large system of simultaneous equations. Hayek, on behalf of the Austrians, agreed, yet maintained the number of equations—presumably one for each product and potential product—is clearly too large in practice. Both sides claimed victory. In the cited article, the author takes the ball from Hayek and carries it across the goal line: after a decent three-page explanation of the diagonal argument, Murphy concludes the Planning Board’s task would not merely be impractical, but fully impossible because of the requirement to publish an uncountably infinite list of prices. I suppose if one started with the assumption there are (at least) countably infinite number of products/services $p_1, p_2, \dots$ and also agreed that any possible subset of these products is again a product itself, the price of which is not necessarily the sum of the component prices (let’s ignore issues of convergence! ), then one could conclude using Cantor’s Theorem ($2^S>S$) there are an uncountable number of products the Board must “list”. But I’m not sure why, if we take the listing process literally, it matters how large the infinity is. The original question, and several of the answers, refer to misuse of Godel's work, but with very few specific citations. For these, I would suggest Torkel Franzen's book, Godel's Theorem: An Incomplete Guide to its Use and Abuse. has assumptions that make it irrelevant for applications, in particular, they are not met in the numerical experiment featured in the paper to illustrate the theorem. Remarkably, the authors use an expression "for any probability measure on (a finite set) $\Phi$ with full support, (something holds) with probability one", instead of saying that it holds for every element of $\Phi$. It seems to be a widely accepted result, published in PNAS with about 500 citations in Google Scholar. Arrow's theorem is often glossed as "there is no good voting system". Press' paper Strong profiling is not mathematically optimal for discovering rare malfeasors has been misinterpreted by the popular press as a mathematical endorsement of certain politics, though that's perhaps due in part to the intentional framing of the problem by Press. Goedel's theorem is misapplied arguably more than it is used properly. Alan Sokal and Jean Bricmont's book deserves some mention if we are talking about misuse of theorems. This isn't exactly what you asked for, but I find it so amusing I could not resist. The Indiana $\pi$ bill, when they almost passed a bill claiming that $\pi=3.2$, in order to be able to square the circle. It is thought by many art historians that Cotán used a mathematical formula to determine the heights at which the various items would appear. For all I know this may be the case -- it would seem only appropriate given the name of the artist -- but I once read part of a book by a very respectable art historian (whose name I have maddeningly forgotten but I'm working on it) who said what the formula was. His evidence was just the picture itself and not any surviving record of how it was painted. But of course, given that the heights of the items are not precisely determined (anything like), it is clear that any number of curves could be declared to fit. This is not exactly misuse of a theorem but it was certainly misuse of mathematics, similar to finding the golden ratio everywhere but a bit more sophisticated. 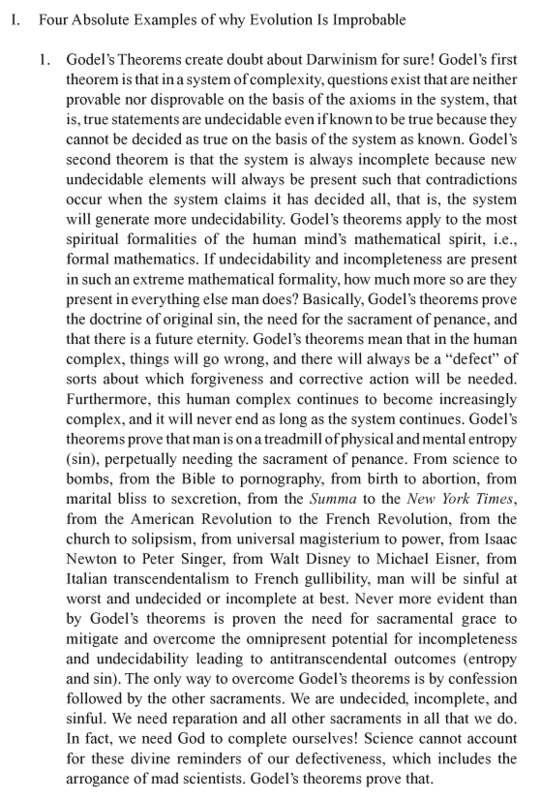 In his book Everybody for Everybody, Samual A. Nigro argues that Gödel's theorems not only cast doubt on the theory of evolution, but prove the doctrine of original sin, the need for sacrament and penance, and that there is a future eternity. Sokal once again, with Brown and Friedman, wrote this paper: The complex dynamics of wishful thinking: The critical positivity ratio (arXiv version). The story behind this is that Nick Brown, "who began a part-time psychology course in his 50s – and ended up taking on America's academic establishment" according to Andrew Anthony in the guardian http://www.theguardian.com/science/2014/jan/19/mathematics-of-happiness-debunked-nick-brown. "Stefan Banach and Alfred Tarski proved, using the axiom of choice, that it's possible to divide a pea (or a grape or a marshmallow) into 5 pieces such that the pieces can be moved around (translated and rotated) to have volume greater than the sun." Clearly, this formulation is very much misleading, since it suggests that the paradox can be applied to a physical objects, which is obviously false. Indeed, the construction is such that the ball is divided into non-measurable parts and, clearly, there is no physical objects corresponding to non-measurable sets. (in other words, topos theory applied to music theory). At least one MO participant at MO (Mikael Vejdemo Johansson) has tried to read this book and came away feeling skeptical, according to his remarks here. I'd be interested in hearing other reactions from people who have taken a stab at it. The whole "transformation" and "network centric warfare" push in the US Department of Defense last decade under Cebrowski and Rumsfeld invoked a heap of dubious interpretations and purported applications of nonlinear phenomena (perhaps most notably when 9/11 was referred to as a "system perturbation"). See here for an introductory overview. I submit, to your consideration, this paper by Frank Tipler, Professor at Tulane University. The paper was published in the peer-reviewed Reports on Progress in Physics, volume 68 (2005), pages 897-964. Tipler's book "The Physics of Christianity" is based on this paper. Tipler invokes Gödel's theorem (see p. 905 onwards), Presburger arithmetic, Löwenheim-Skolem, Hales' proof of the Kepler conjecture (the latter only as an example, I believe), and various other mathematical results. Quantum Mechanics studies the peculiar world of the "ones"; those things in nature that can not be divided. Since God is a One, and the Body of Christ as well, it shouldn't be surprising that the Bible discusses the "ones" at length, and this a few millennia before the emergence of Quantum Mechanics in the scientific arena. To appreciate this unexpected dimension of the Bible, Abarim Publication's fun-filled crash course in Quantum Mechanics should be mandatory at every seminary. Chaos Theory looks at patterns and their reoccurrence in nature. Since Moses built the tabernacle - which would turn into the temple, and later still in the Body of Christ - after patterns he saw in heaven, Chaos Theory is a must for every serious student of the Bible. What Chaos Theory does with nature, Scripture Theory does with Scriptures: the identification of reoccurring patterns and their meanings. Especially interesting are those Biblical patterns that are identical to those found in high-energy physics. Not really a theorem but amusing non-sense. Somebody (it was perhaps Sokal) told me about a psychanalytical book based on set theory. The author wrote it in English and translated the french terminology "th\'eorie des ensembles" as "Theory of the (w)hole". The book was later translated into French with the title "Th\'eorie des t(r)ous". It's physics rather than math, but surely this creative paper by Alan Sokal deserves mention. A rare instance of Gödel-abuse in a published paper is "Bacterial wisdom, Gödel's theorem and creative genomic webs" by Eshel Ben-Jacob. Here, Gödel's theorem is used to prove that "a system cannot self-design another system which is more advanced than itself", with application to genomics. 2) (this is maybe what you mean in the post) it follows from the Godel's theorem that God does not exist. This is my favourite example. Authors try to analyze how librarians work, by making an analogy with fractals. Also, the obligatory reference to Heisenbergs uncertainty principle. In the same vein as the bayesian argument for creationism and misapplications of Gödel's incompleteness theorems, there are misapplications of the second law of thermodynamics against evolution of life ("undesigned", e.g. darwinian or lamarckian). The second law is a mathematical consequence of Hamilton and Schrödinger equations for reasonable hamiltonians, in particular of fundamental physical evolution equations, and also of simple statistical models (statistical ensembles). See Wikipedia. The argument is that life is complex and evolution implies a decrease in entropy/increase in complexity contradicting the second law. See for instance here. The flaw is that the Earth, where evolution occurs, is not an isolated system. If we consider rather the solar (or just Sun-Earth) system there is loss of entropy on Earth but a compensating gain on the Sun. For a recent anecdote (and a nice blog to add to your blogroll) see Retraction Watch. Dr. Jason Lisle provides “a little window into the mind of God” by exploring the amazingly beautiful and complex secret code that God has built into numbers. Using fractals – types of structures that repeat infinitely on smaller and smaller scales – Dr. Lisle demonstrates that the laws of math couldn’t possibly have resulted from any kind of evolution and could only have originated from God. Fractals have no reasonable explanation in the secular/evolutionary worldview, but their intricacy, complexity, and wondrous beauty reflect the infinitely complex and inexpressibly powerful mind of the Creator. Not the answer you're looking for? Browse other questions tagged ho.history-overview big-list applied-mathematics popularization or ask your own question. Theorems first published in textbooks?